The first three days in the field were devoted primarily to the collection and processing of data using ground-penetrating radar (GPR) in order to obtain a subsurface mapping of the garden's earthen terrace which measures approximately 65 x 53m. The GPR team employed a Geophysical Survey Systems Inc. (GSSI) Subsurface Interface Radar (SIR)-2000 system that is the latest version of the digital systems that control radar propagation in the ground and record the resulting reflections. As the 400 MHz radar antenna was moved along measuring tapes laid out in a grid, data was collected every 50cm for maximum illumination of subsurface features. Energy propagation occurred to a depth of about 3.5m. A total of 103 transects of reflection data was collected. 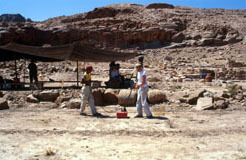 The radar is pulled across the terrace by L. Conyers (top) and E. Ernenwein (bottom) assisted by A Qoblan. 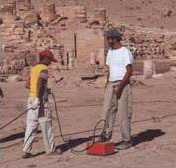 The GPR results are transmitted to a computer monitor under a nearby tent.